Most catfolk are tribal hunter-gatherers who dwell in harmony with nature, though some tribes have acclimated well to urban environments. As a culture,catfolk are loyal, generous, and amiable. They like belonging to and being at harmony with a group whose members work together to accomplish their needs and wants. Tribal catfolk prefer for the most capable societal members to lead, so every tribe has a council of elevated subchiefs. A tribe’s chief is usually the most competent (and magically talented) member of that tribe. +2 Dexterity, –2 Wisdom, +2 Charisma: Catfolk are agile and amiable, but they are known for their lack of common sense and self-control. Natural Weapons: Catfolk are able to use their claws and teeth as primary natural weapons. A catfolk's claws deal 1d4 + STR damage and their bite deals 1d4 + STR damage. Cat’s Luck (Ex): Once per day when a catfolk makes a Reflex saving throw, it can roll the saving throw twice and take the better result. It must decide to use this ability before the saving throw is attempted. Sprinter (Ex): A catfolk gains a 10-foot racial bonus to its speed when using the charge, run, or withdraw actions. Languages: Catfolk speak Waesa and Common. 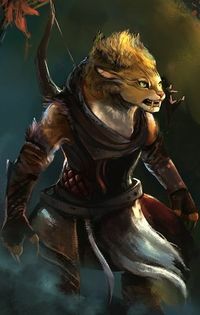 A catfolk who has a high Intelligence score can choose from the following bonus languages: Elven, Gnoll, Gnome, Goblin, Halfling, Orc, and Sylvan.